The New Year has arrived, it’s time for new year’s resolutions and you should include plant and garden resolutions too. Resolutions that will add life to your outdoor space. Here are the gardening tips for the month of January to get your lawn and garden started off the right way. One of the first things to do is fertilize Bermuda grass and lawns overseeded with rye grass. It’s also important to feed lilies and other bulbous plants. Now is the time to check your peach trees for white peach scale. Spray peach trees every 10 days from “pink bud stage” until one week before harvest with combination fungicide and insecticide such as Fertilome’s Fruit Spray. Taking this measure will prevent blossom blight, brown rot, and worms in fruit. While most of your plants are now dormant, pruning and trimming is a must. Annuals bloom more and longer if old blossoms are picked off and bouquets are cut promptly from home. Now is the ideal time to prune or transplant your trees and shrubs. An important reminder is to watch out for termites. They can swarm on warm, humid days during January. While kicking off the New Year make sure you continue to feed vegetables and annual flowers lightly every two weeks. We are looking forward to a great year and we hope you are too! William R. “Bill” Doty is the owner of Doty’s Farm and Garden Supply Inc. Founded in 1954, Doty Farm and Garden Supply, Inc. has been there for every one of their loyal customer’s budding needs. Bill Graduated from Winter Haven H.S. and then Florida State University, where he learned invaluable lessons in listening, asking questions, and reading anything related to the family business. 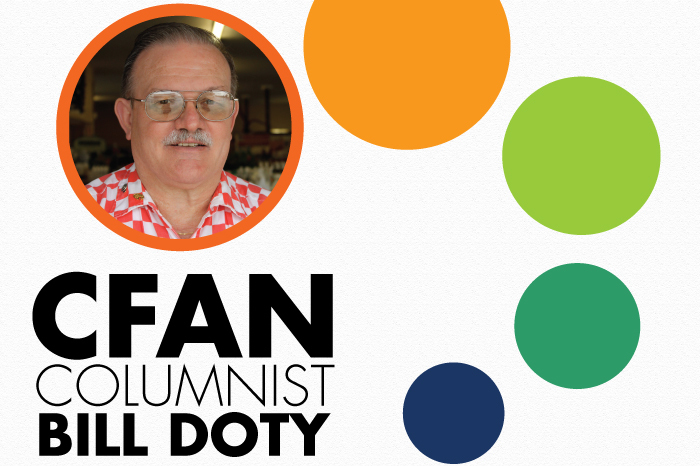 Bill shares his knowledge with his customers daily and our readers each month.